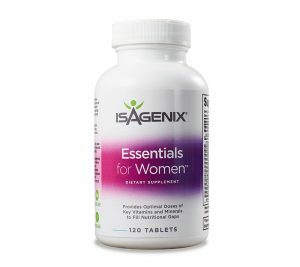 The Isagenix Essentials for Men and Women is a daily multivitamin that contains minerals and bioactive compounds specifically formulated for men and women. Not only does this Essentials for men and women helps protect against poor health, but for men it provides increased energy and a healthy prostate for men. And for women it contains calcium and other essentials for strong bones, luscious hair, nails and skin. Each Isagenix Essentials multivitamin contain active enzymes to ensure smooth absorption at timed intervals throughout the day. For best results use Isagenix Essentials daily and in conjunction with Product B IsaGenesis and Ageless Actives. These three products (and more) can be found in the NEW Complete Essentials with IsaGenesis pack — highly recommended! Each bottle contain 120 tablets. Sign up with Autoship to take advantage of the Isagenix opportunity and open the possibility to create substantial income. Get access to wholesale prices and scheduled delivery from warehouse to your doorstep. Change your scheduled order or make additional orders whenever it suits you. You have the option to cancel Autoship at anytime with no contracts or strings attached. Have access to Isagenix wholesale prices but miss out on the fantastic Isagenix income opportunity. You can purchase Isagenix at full retail price if you prefer not to sign up and take advantage of the wholesale prices and Isagenix opportunity. Remember, if you are not fully satisfied with your products send it back for a full product refund. All products for your first order are covered by a 30 day money back guarantee, you have nothing to lose but body weight! Full details here. By signing up with IsaElite you will receive unlimited support, ideas, encouragement, business tools & resources and product information. You will have access to our highly supportive private Facebook groups. We benefit from your success. We want you to succeed!